Performing Heritage. No guide-speak, this. Though long in the know of her scholarship, I was served an opportunity to participate in a heritage walk led by academician, performing artist, and cultural activist Dr Navina Jafa only last year. She had graciously acquiesced to curate a Ramazan Walk exclusively for members of the Travel Correspondents & Bloggers Group, which proved to be one of exceptional strolls undertaken through Shajahanabad in recent memory. It coincided with the roza iftar being observed in the expansive courtyard of the old city’s most evocative landmark, Jama Masjid, silhouetted against a persimmon sky. Milling families hungrily awaited the muezzin’s sunset call to break their fast with the customary dates, bestowing upon its colossal proportions an all-encompassing vivacity hitherto un-experienced. The trademark megaphone slung across her shoulder notwithstanding, only one feature surpassed our generally atmospheric and lively surrounds and that was Navina’s animated passion for parampara–her definition of choice for all manner of heritage. 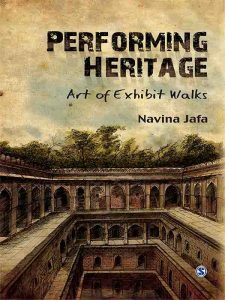 The reasons for which she lucidly elaborates in the chapter titled ‘Debating and Speculating Heritage’ in her book Performing Heritage: Art of Exhibit Walks, a critique on the art of presenting heritage a pied; an increasingly preferred medium. The Sanskrit meaning of the word parampara implies a dynamic, flowing tradition, and walks it is argued, as cultural productions, exhibit heritage as a vigorous force from within its natural habitat. It is this changing character of tradition, she explains, which is fundamental to its survival, regeneration, or resurrection, whether as a living traditional entity or as a tangible heritage structure. Navina cites the example of the Taj Mahal, among others, to illustrate how growing awareness confers on heritage multiple identities. As part of public culture past, the iconic marvel-in-marble was a religious site surrounded by a bazaar and community neighbourhood we know as Taj Ganj. Lived in and maintained by the community as a sacred space. Over time the Taj became a protected national monument, took on a secular identity and is today a world heritage site. And the community continues to actively engage in the resulting repackaged industry. In the ensuing chapter ‘Functionality, Designing, and Executing Walking Tours’, the author discusses at great length the concept of classifying tours as living exhibits, as well as their multi-purpose potential. Not least as cultural displays expressed both as art and conservation device. “The art of crafting exhibits strives towards devising visual effects, observing neutrality in the presentation, and creating an aesthetic experience. The narrative and the theatrical execution of it are central to the effectiveness of the display,’ she elucidates. Not mere pontificating, I must add, as this pioneer of academic cultural tourism has successfully applied all of the above to her immensely sought after heritage walks. Seeing as how she has an enviably astute grasp and expression over the subject; a veritable repository. As a presenter she is many paces ahead of her peers, yet magnanimously shares the skills and techniques required to catch up with her in a chapter titled ‘Making of a Study Leader’. Although the role is primarily similar to that of a guide, she clarifies that this format of public cultural education mandates an academic background for the effective employment of related methods and multiple skills. Those of researcher, public academician, communicator, performer, and storyteller, all of which she combines with much élan in her craft. ‘Walking Tours: Aspects of Economic Culture’, the penultimate chapter underscores how showcasing academic heritage professionally could emerge as a major contributor to the economy. As a collective, academics assist to a large extent in the broad understanding of cultural heritage. In an individual capacity, a creative approach towards exhibiting cultures not just conserves and propagates heritage as symbols of social values, but also balances genuine content with a keen sense of business. Navina believes, writes as much, that initiatives such as these should be valued for the benefit they provide to society at large. In the last chapter ‘Walking Exhibits as Brokering Culture’, the author expounds how the norms and principles that shape a successful enterprise when applied to heritage presentation can also experience similar results. Citing her experience as example, she shares the methodology that promises to turn walking tours into an economically sustainable activity in great detail. Performing Heritage, though replete with illustrations and fascinating historical and cultural references, does not quite fit the bill as a leisurely bedside read–it was not meant as such. It is irrefutably a seminal and encouraging work, indeed more than mere hand-holding, for those aspiring to match Dr Jafa’s steadfast stride in the industry.